The hubs came with me to catch up with some friends at our new favorite sports/oyster-bar kind of place. Johnny and I hand’t been there since we had been dating, and even though it had changed hands? The steamer worked like a champ. Who WOULDN’T want a personalized bone salt & pepper shaker??? 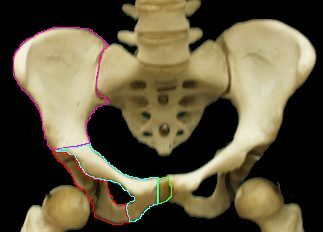 At any rate, one of my friends mentioned that she wished that she could have taken home the bones from her hip replacement…which she was unable to do. They give kids their tonsils in a jar, and that’s just…ewww…but they won’t give a grown woman her bones? You can take home teeth you’ve had pulled or had cut out (I had my only extracted wisdom tooth floating around here in a box, thinking that I would keep it and have a matched set someday to do something cool with), but no. No bones. She thought it would be cool to re-purpose, re-use, and recycle bones. She was thinking perhaps book ends or salt and pepper shakers. I was thinking, “Oh, I KNOW there is a blog in here somewhere!” And then, I remembered scrimshaw. Does anyone remember scrimshaw necklaces? I think a scrimshaw salt and pepper shaker would be cool. ESPECIALLY if created from your bones or those of your loved one. Now, my friend is not old enough to be having these kinds of surgeries, but I have to tell you…She is not the first person I have met that has been that young to have had a major surgery. I don’t know what it is about this generation, but we seem to be going under the knife more and more for things that 70 year old people are having done. What’s up with that? But I get off track…I hate when my train of thought de-rails. 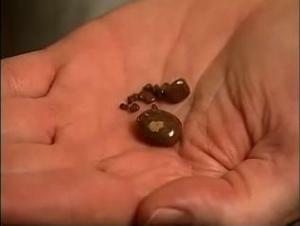 How cool would it be to wear earrings made of kidney stones? I know, I know…y’all are thinking, “ewwwwww!” I’m not sure what they look like, so I am reserving final judgment until I google what they look like, but they might make neat looking beads, especially if tumbled like rocks. ~*~*~*~ So, ok..I just googled that, and many of the wouldn’t even have to be tossed into a rock tumbler. That said, I have to know…What is the most bizarre idea YOU have ever had as a creative outlet? PS…Don’t forget to follow me on Facebook and Twitter! This entry was posted in Friends, Of Interest and tagged arts & crafts, going green, oysters. Bookmark the permalink. I painted some antlers jet black, but nothing bodily-created. OMG…You read it and you’re still here! 🙂 Thank you! I was so worried that this was too morbid for normal people. 🙂 How did your tattoo turn out? I posted a pic on a post a bit or so ago. go check it out! do that mean you are gonna keep yer old hooters? Why? Just cuz they would not make great jewelry? Awww, HELL no! I’m just kinda hanging around trying to lose a few pounds before my next re-evaluation, because the insurance company now needs a letter of medical necessity. And I’m thinking Dr. E probably will not save breast tissue for me to create jewelry (or even commission SEGekko Jewelry & Design to make jewelry) out of. HOWEVER…I might have enough to get some cute ankle height moccasins out of.